Above are two ways that I would style a suit. Just easy outfits that instantly make me feel put together! 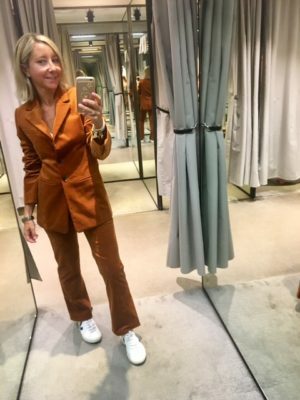 I am not sure if you remember the Baukjen checked suit that was all over Instagram…well this is a more affordable version (I love and work with Baukjen but it is not longer available) from New Look. Again checks are not for some people but I had to show you as I think this is a fab price! I couldn’t possibly have not included some fabulous finds from H&M I really think they have changed a lot recently and the quality of clothing has really improved. It is very much somewhere I would go for ‘fast fashion’ but their current cords, suits and dresses I love! This is one of my absolute fav0urites and these trousers fit so well! Mango will always produce fab coordinates too. Burgandy is one colour that my husband hates on me. I am not sure why but I think this suit looks lovely with pink, turquoise, khaki and black. Again dress up or down. Well it wouldn’t be a fashion blog post without Zara would it! I adore both these suits. The rich dark rust colour is another favourite of mine and I would struggle to choose between them. How many corduroy suits does a girl need?! The & Other Stories suit that started it all! I tried this on and fell in love! A lady in the next changing room was trying on the Blush pink which is equally as lovely. Fab quality and cut and as you can see here (ignore my silly selfie face) it works well with my trusted Veja trainers! Love, love, love! Well I hope this little post has given you a few ideas into how a suit could work for you this season. 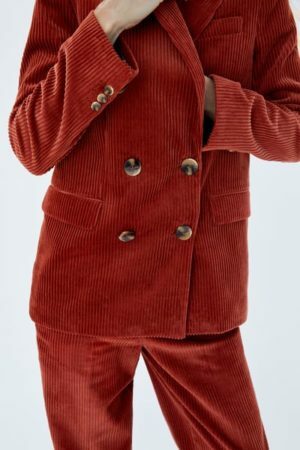 I will most definitely be investing in a suit, most probably in corduroy. I think the days of the Science teacher reference are over! Previous Post Suns out, legs out!